A site where a man with far too much interest in beer gets to write about it. American has long been known as a backwards beer country but things are starting to change. I was delighted to see that New Brewer magazine has an article on the one true living beer. 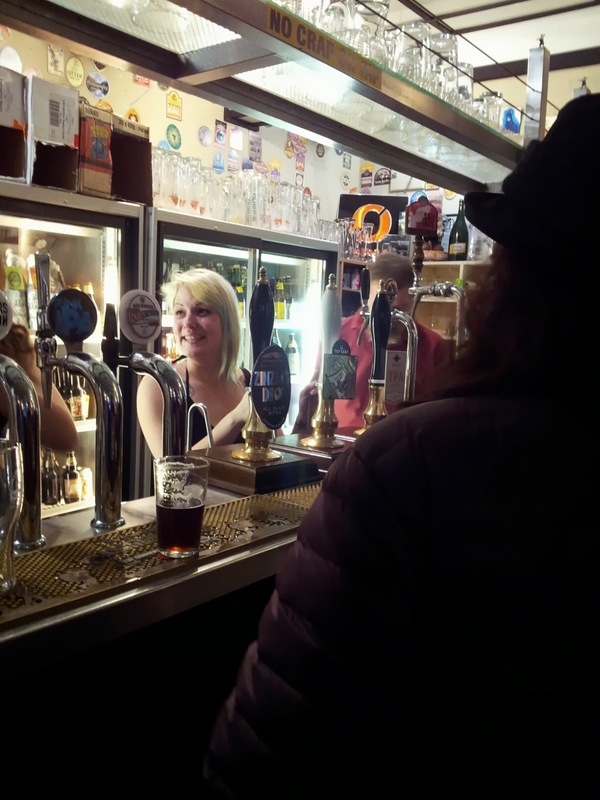 "Cask ale is growing as rapidly as craft beer in the U.S. and maybe even more so." "Thankfully, we are also seeing an improvement in the standard of the pint crossing the bar, but there are still improvements to be made." 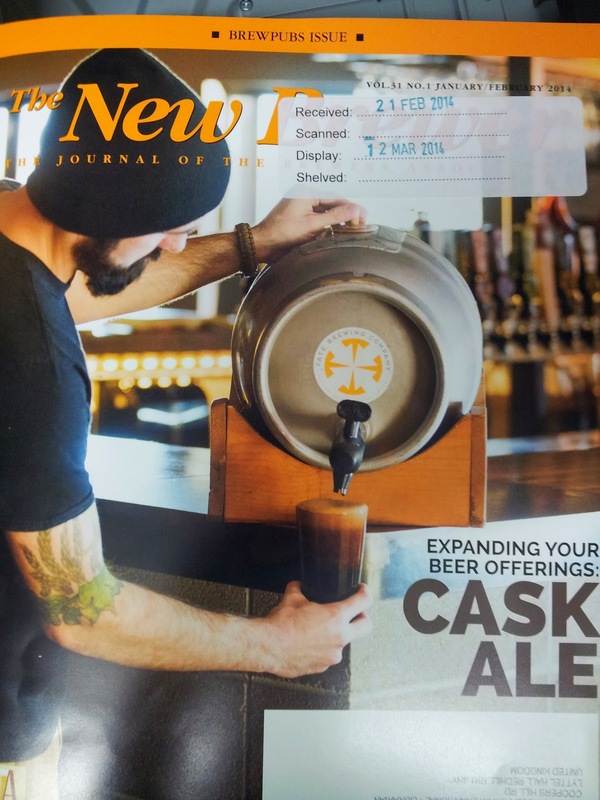 There still seems a need for more information on cask beer. The article will no doubt help, but the author seems to have worked out his own way of making cask beer, which I think it's fair to say is slightly odd. He adds a yeast starter to each cask, which I've never heard of anyone else doing, and is surely impractical unless you're filling a very small number of casks. There's also no mention of the fact the beer still needs to have some fermentable sugar when racked, either from the primary fermentation not being completed or as added priming sugar. He also rather oddly talks of goosenecks instead of swan necks and gives the dreaded sparklers more prominence than they deserve. Perhaps there is a need for beer missionaries to cross the Atlantic and spread the good beer news? From the South of England preferably, we don't want to encourage sparkler use. Beer should be racked to cask with 0.5 to 2 million yeast cells per ml. The CAMRA guide to cellarmanship is an excellent source of information for those looking to serve beer from casks. I don't suppose the findings will come as much of a surprise to beer geeks but I am starting to wonder why it keeps happening. There's no reason that big breweries can't make any beer they like so why do many keep getting it wrong? Some would try to explain it by lack of passion but I've never been taken with such vague explanations. I do have to wonder if anyone in the companies involved actually drinks the beer they're trying to sell though. If they did they might be able to producing a beer people actually want to drink, which should even save a few bob on the promotional spend. To coincide with St Patrick's Day an article in the Economist has debunked the usual Guinness guff, and even claims that in the 80s it came close to being re-branded as an English stout. There's some interesting stuff in the article. I knew the Guinness family are prods, and were opposed Irish independence, but I was surprised to see that one went as far as providing considerable funding to the original Ulster Volunteer Force in 1913. I haven't studied the history of Guinness, and sadly no references were given, but I'm temped to start now. Though perhaps I'd better get through all the beer books and magazines I have piled up around me first. Drink is the joy of the Russians! I heard a programme about the history of Russian and Ukraine the other day. No mention of my favourite Ukrainian but it was interesting all the same. The story of a pagan Russian prince keen to choose a new religion for his subjects was recounted. It seems he sent envoys out to study the major religions around him but rejected Islam because "Drinking is the joy of the Russians". He also rejected Judaism, though whether this was because "bacon is the breakfast of the Russians" they didn't say. In the end he went with Orthodox Christianity and the rest is history. I wonder if things would have turned out differently if he didn't drink? 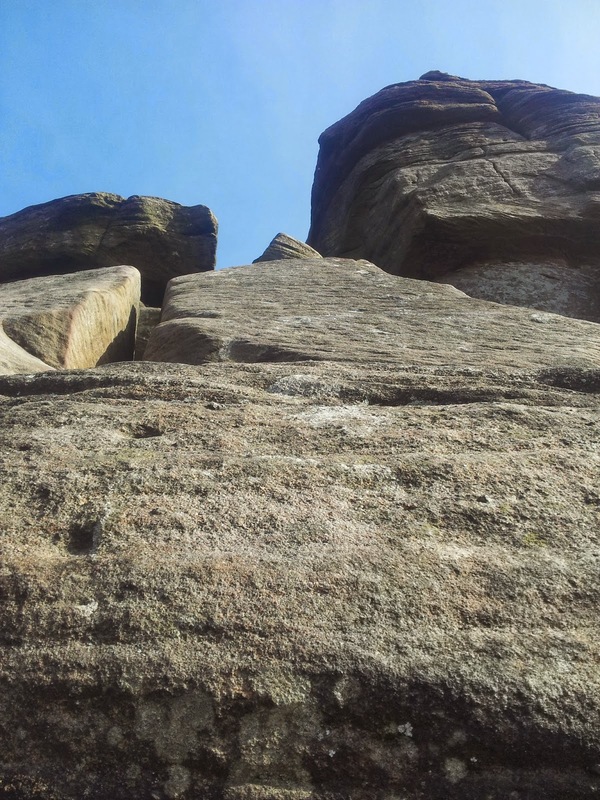 The day after my stint at BeerX I took advantage of being in Sheffield to go climbing on the gritstone at Froggatt Edge. Having stayed at the nearby Climbers' Club hut I got there early and had the place to myself. I'd figured that as a lot of the slab climbs there are unprotected it wouldn't make any difference if I was soloing them or leading them so I might as well go climbing on my own whilst I was in the area.When I got to the rock the flaws in my plan quickly became apparent. For starters the rock looked steeper than I remembered, and the holds smaller. As a warm up I climbed Sunset Slab a route I'd previously lead easily, but without the benefit of even a psychological runner I did not feel at all happy and I wasn't moving well. And rather unhelpfully the song Freefall had started going through my head. Thanks brain! Next I had a very brief look at Sundowner, but quickly bottled it and scuttled right to escape up Sunset Crack. Things were not going as I'd hoped but the weather was stubornly staying good so I had no excuse to bail out. I wandered on to the Three Pebble Slab area to look at a couple of routes I'd lead before, but again they seemed to have got taller and steeper since I'd last seen them and didn't look appealing. Then I remembered there was a route on the right, not listed in the guidebook I had with me. Nanoq Slab had an easy start and a large and comforting ledge at half way. Though the holds in the trickey top half were modest in size there seemed to be enough of them to make an ascent possible so despite my earlier poltroonery I went for it. It was delicate climbing but a couple of pebbles embeded in the slab proved the key to the crux and as soon I could stretched and slapped for the top, and had another E point to add to my tally. In fact worried it might have been down graded I later had a quick shufti at the new definitive guide and saw it had in fact been upgraded to E2 so I'm claiming that. I did wander on a bit more after that but nothing took my fancy so I decided to quit whilst I was ahead. @TheBeerFather kempka's butchers on Abbeydale rd. So my journey home had a short detour and vital supplies were obtained. 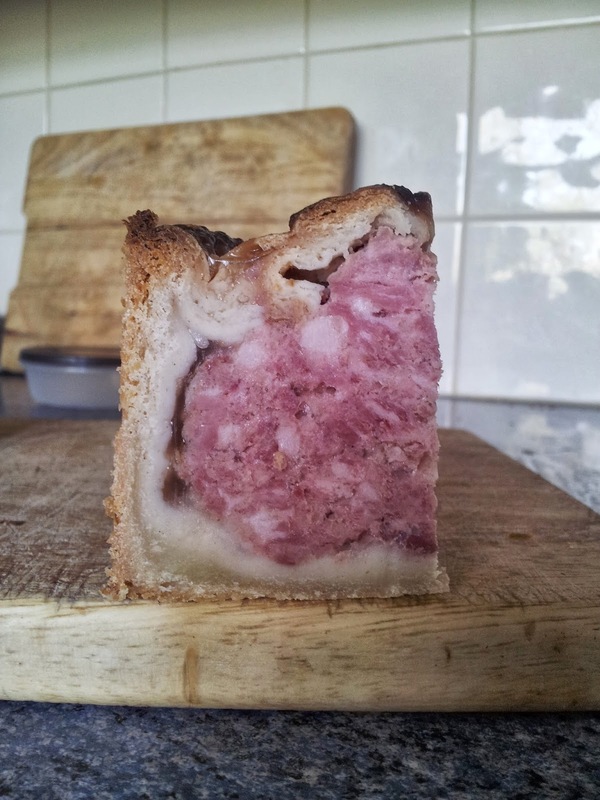 Praise the lard! Last week I went to the SIBA conference and beer festival for the first time. 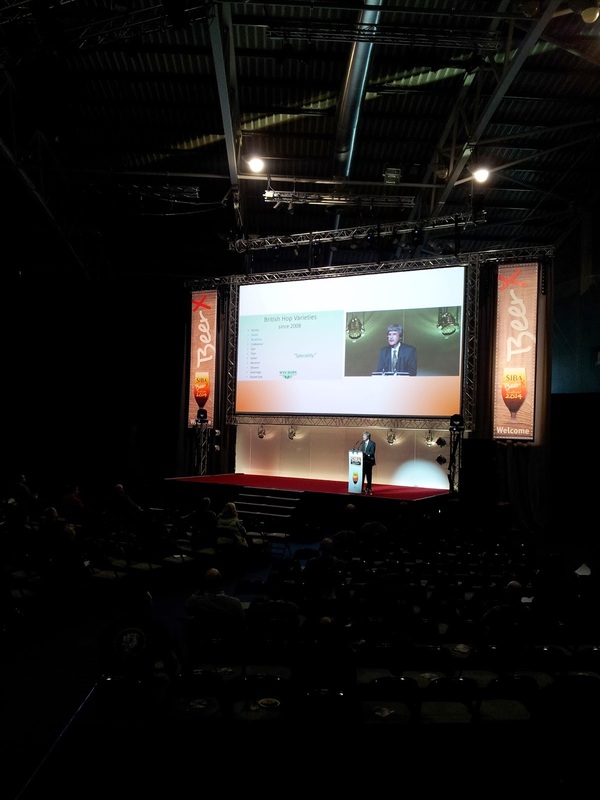 Though as it was for work there was much more conference than beer festival for me. I didn't manage to meet all the people I'd hoped to, but on the other hand I did meet some people I hadn't expected to. I heard some very interesting news from the owner of the unrighteous brewery I used to work for, and there's even the possibility my longest running brewery boycott could come to an end in the not too distant future. Not working for a SIBA brewery I didn't go to the business session of the conference, where they sensibly decided not to try and define craft beer (and anyway I've already done that for them), but I managed to get to a couple of the lectures. The timetable was very crowded though so they were all short and with little time for questions. Peter Darby's talk was about the every growing number of British hop varieties, and we can now add Olicana, a daughter of Jester to the list. The new varieties are all currently grown on a very small scale but I'm sure with the interest shown in them production will continue to grow. I spent more time having curries than at the beer festival, but I did manage to get a few beers in. 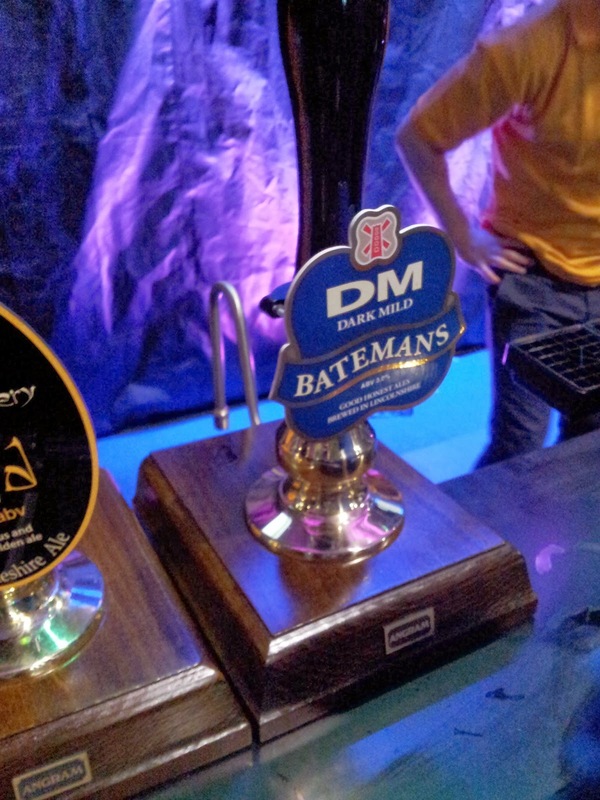 The most interesting for me as Bateman's Dark Mild, as I thought it had been discontinued. I had a half whilst I still could and very nice it was too. From the curries I can't recall any fascinating beer facts, apart from hearing that there are only three polyploid varieties in the national hop collection because polyploid hops grow bigger cones and leaves, and the large leaf size provides too much shade for the British climate. But I was very impressed by beer academic Charlie Bamforth's encycolpaedic football knowledge. That he could name Tim Buzaglo as the hat trick scorer in Woking's 1991 win over West Bromwich Albion was astonishing. I enjoyed going to BeerX but it was tiring, which didn't really set me up well for what I had planned after, but more on that later. I was back in Borough on Saturday for a Brewery History Society committee meeting. I've been asked if I can take over arranging their visits. This is a slightly daunting prospect as despite his diminutive size my predecesor will be leaving some rather large shoes for me to fill when he steps down. In fact there's absolutely no chance I'll be able to plan things as well as him when I take over, but with my current job I am well placed for brewery contacts so hopefully I can make a good go of it. The meeting was in a room they have upstairs at the Rake. Who'd have thought the Rake has a meeting room? You do actually have go outside and in another door to get to it, but I think it's actually over the bar. Speaking of which after working my way along the handpumps I didn't find anything particularly inspiring so we wandered on to the Market Porter where Bingham's Bricks and Mortar was on excellent form and kept me happy until it was time to stagger home. "The Off Licence News reports a 'catastrophic' fall in sales of standard lager and that ale accounted for 30% of total beer sales in the last quarter of 2013 against the usual share of 15%. Marstons sold 40% less standard lager and cream flow T-bar ales like John Smiths and Worthington lost 15%. Looks like a major resstructuring is going on and the big boys are sure to react." Some striking statistics, it will be interesting to see if the trend does continue. There was no way I wasn't going to like this book. Old fashioned beer has long been a fascination of mine. Soon after I'd started all grain brewing (or full mash as we called it then) I attended a course for homebrewers run by Brewlab. James McCrorie was also there to talk about the Craft Brewing Association he was forming, and from that learnt of Durden Park Beer Circle and their booklet Old British Beers and How to Make Them. It was from there that I first heard of the golden age of British brewing before the horrors of the First World War, and saw that Farnham was once famous for hops. Though the Craft Brewing Association now seem decidedly lagging with the internet some of the first things I ever downloaded (by asking my brother to do it at work and print it out!) were from them. In the years since then the amount of easily available beer knowledge has massively increased, in fact to the point where it's not possible to keep up with it anymore (though that doesn't stop me trying!). 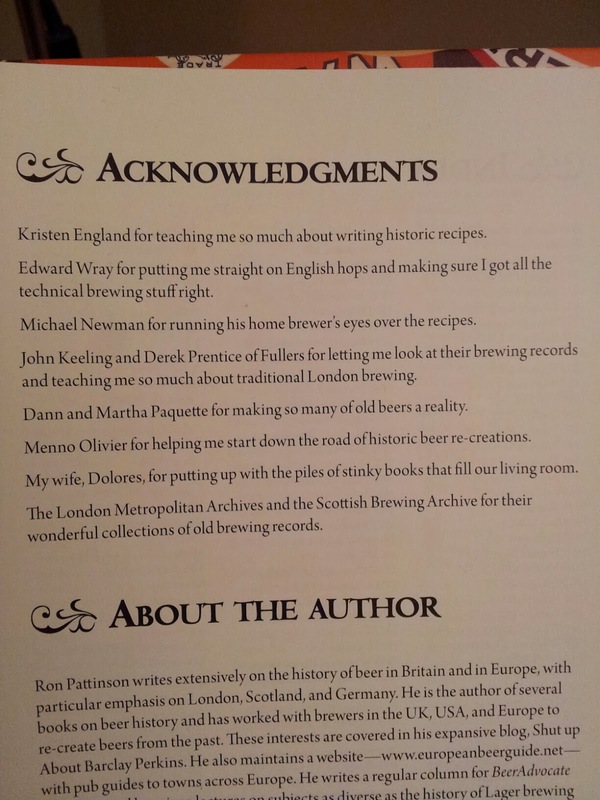 More than anyone else Ron Pattinson has made available information from historic brewing records providing detailed, and at times surprising, information on what and how different types of beer were made over the years.I'm a regular reader of his blog and have several of his self published books. He's shown that despite producing an inspirational text the Durden Park Beer Circle were a bit too free and easy when they adapted historical recipes for modern homebrewing, and the bit of historical research I carried out myself shows that there's a lot more to Farnham hops than is mentioned. My hop research lead to Ron contacting me before publication to discuss British hop history, and I was also sent an early version of the text to cast my pedantic eye over. So, this is a book about a subject that's long fascinated me, and that I had a small role in producing. Not to mention that I got sent a free copy. As I said, there's no way I wasn't going to like it. But I'm pleased to say it's actually really good. The format is slightly odd, being ring bound with a hard cover but it is an excellent design for a recipe book. You can lay the book flat on a surface so you can read the pages with your hands full and the hardback cover will provide good protection. At just 160 pages it would scarcely register as a 'mini-book' if it was one of Ron's self published offerings but it's good to see, quite possibly for the first time, that when constrained by space he has the ability to succinctly get the important information across. I still wouldn't have thought the book over long if it was twice as big though. Divided into 12 chapters there's some background information about ingredients and brewing before historical recipes for different beer styles are presented after a short historical introduction. The beers cover rather more than the key styles Ron has boiled British beer down to (porter, mild, bitter and strong; or should that be Porter! Mild! Bitter! and Strong! ?) and some obscure European styles are detailed as well. Ron makes clear there has had to be some interpretation of the recipes, and I did notice an impossibly early Bramling Cross hop in one from 1915 (possibly should be the Bramling golding?) but until the day the long awaited time machine is found I can't think of a better way to find out what historic beers tasted like than trying some of these recipes. It's a.little known fact that I'm already famous being mentioned in a book by name, but now I'm in two I must be twice as famous. But I care little for the fortune that will no doubt be following soon (though I'm looking forward to the groupies). The going won't be easy, but I'm going to make it, it's the only thing that I'm cut out to do. WE WANT GIRLS ON OUR BEER!!! The Missing Drink - Beer. Cocktails. Spirits. I don’t want to change the world, I’m not looking for New England. The Professor on Lemons, Peaches and Cask.